Bobbing for apples in a giant vat of grape flavoring. Cooking has become something that often takes place before the grocery store, creating both the saltiest of microwaveable dinners and the best (frozen) veggie burgers. With recent food crazes like the Low-Carb revolution, traditional products and foods have been re-engineered to meet the criteria of a mass of converted shoppers. From one perspective, "designing" and "cooking" are not disparate terms when related to the process of combining different food ingredients in specific order, and using heat to catalyze the reaction of their intrinsic chemical properties. Described as such, the process of cooking sounds more like a science experiment, one that certainly could be designed. As Harold McGee writes in the introduction to the new edition of his encyclopedic On Food and Cooking, in recent years "science has found its way into the kitchen, and cooking into laboratories and factories." But when scientists toy with the atomic units of food -- the direct products of living things or living things themselves -- the conversation gets more confusing. There are many recipes using apples -- my housemate is currently perfecting an excellent free-form apple tart -- but no recipe to create an apple, other than the magical stuff of life. It is this fact that seems to both trouble and excite people about the prospects of designer produce, the next step in the designer foods that have populated the shelves of grocery stores for decades. Clearly, the Genetically Modified Organism (GMO) debate is the most contentious issue in this arena, with supporters insisting such technology can boost nutrients and decrease pesticide use, and critics shouting the dangers of crop monoculture and the unproven effects of such products on humans and the environment. Designer produce, however, does not just consist of genetically modified foods. In the following discussion, I will ignore the politics and just talk about the science and background of four different foods that have been designed for specific attributes in ways that could have only occurred to humans. The Concord Grape and the Washington Apple: a tale of two fruits, a tale of two northern coastal states. Or sort of. When you hear the word Grapple pronounced correctly, it sounds less like a struggle to understand and more like a staple. When I first learned of the existence of this new fruit, I wracked my brain to picture how an apple and grape could have possibly been crossed, as I am certain you are wondering now. In reality, we are both way off the mark. Grapples, a trademarked product of Grapple Fruits LLC, are not some sort of genetic monster. In fact, the Grapple is created by dipping apples in a giant vat of artificial grape flavoring, storing them cold for a few days until the grape flavor fully incorporates throughout the apple, and then shipping them to their destination. The result is a fruit that looks and feels like an apple but tastes like a grape popsicle. According to their website, "Kids go wild over them, too!" I remain skeptical. As it turns out, the science behind the Grapple is fairly simple. Apples are spongy and absorbent, and the grape flavor is strong enough to overpower the intrinsic taste of the host fruit. In the end, the Grapple is more a marriage of a pristine apple and some vat of chemicals birthed beside the New Jersey Turnpike. This week, Memorial Day ignited the American barbecue season as it does every year, and along with the burgers and dogs came watermelons. The large oval shape of this fruit creates curved pie-like slices that fit neatly around the human face as the teeth pick out the last bit of flesh. However, anyone who has tried to store a watermelon in the refrigerator knows it to be an unruly proposition. Even more so in Japan, where space is slim and fridges are small. And so the square watermelon was born. This particular alteration also turns out to be a GMO fake out. There is no "oval" gene in a watermelon, or it least not one that could be replaced with something that reads "square." The normal shape of a watermelon is simply reliant on the physics of its growth. If you place a growing watermelon in a square glass box, however, it will grow to be square. Square watermelons are currently only available in Japan, where they maintain a price tag equivalent to $85 USD. In 2001, only 400 such watermelons went to market. Even with their space saving shape, square watermelons seem doomed to stay square. Not unexpectedly, marketing strategies for designer foods are created before the foods themselves. Why bother developing a product if you don't know how to sell it? This is certainly the case with Golden Rice, perhaps the most valiant of products out the doors of the Monsanto corporation. Golden Rice is created by a genetic alteration process that adds two key genes into the code of the normal rice plant. The genes, crtl and psy are both integral to the biosynthesis of Beta Carotene, the precursor of Vitamin A, and their presence causes the rice to have a yellow tinge and high levels of Beta Carotene. This nutrient is a necessary part of the human diet and deficiency of the vitamin during childhood leads to blindness as well as risk for anemia. Since rice is a staple for many developing countries -- especially in South Asia, where Vitamin A deficiency is most prevalent -- Golden Rice could be priceless to the over 100 million children worldwide at risk. Perhaps more notably, Golden Rice is also about selling the idea of GMOs to NGOs. Here's a question, what do Kale, Cabbage, Broccoli, Collards, Brussel Sprouts and Cauliflower have in common? Why, they are all members of exactly the sample species, Brassica oleracea! I haven't quite been able to understand how these morphologically divergent vegetables could really share the same scientific name, but I guess its just as crazy as taking a look at Canis familiaris. A number of years ago, someone decided that in a duel betwixt broccoli and cauliflower, the flavor of the former was superior, though the consistency of the latter was supreme. 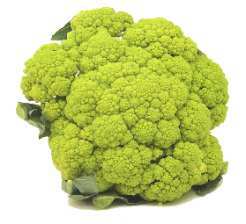 Being of the same species, a simple hybridization was all that was necessary to create the Broccoflower. It is a completely innocuous example of a designer vegetable; without ethical quandary, difficult procedure or offensive taste, developed specifically because it was possible to do so. In all fairness, this particular example does not exactly fit into rubric which I laid out at the beginning of this piece. If wild broccoli and cauliflower somehow grew next to each other, it's quite possible that they could hybridize without a human hand coming near them. As technology introduces new and better products into our lives at an uncontrollable clip, there's a tendency for this trend to be grafted onto everything else, including food. A plain old apple? Boring! How about an apple that actually tastes like a grape? Wow! Food engineers will continue to come up with the next best thing, but I still wish they'd reveal why its impossible for me to stop eating Doritos.